Bridge 3 Release - GeoCat B.V.
GeoCat proudly presents a new release of GeoCat Bridge; version 3.0. GeoCat Bridge is an extension for ArcGIS Desktop to publish the layers from an ArcMap map project (MXD) to GeoServer or MapServer as OGC Web Services (WMS/WFS/WCS) and publish the metadata of layers to GeoNetwork opensource catalogue. You can read more about what GeoCat Bridge is and can do here. The new release includes many improvements and a number of new features. In this blogpost we give an overview of the most notable improvements and features. The most obvious improvement you will notice right away is the overhaul of the graphical user interface; all the forms now comply to one unified style. Secondly we extended the number of styles that are supported by Bridge, see the documentation for an overview of the supported styles. Also we made sure that the supported styles are both supported in GeoServer and MapServer, with a number of exceptions. Since some styles are not possible in GeoServer or MapServer. The most notable new feature is the managed workspace mode for GeoServer. This option can be configured for a GeoServer connection and when turned on, Bridge will create a new workspace in GeoServer for each MXD that is published. In this way your MXDs are mapped one to one with workspaces in GeoServer, so you have all your layers neatly organized in GeoServer. Another new feature is support for GeoCat Live, GeoCat’s SDI cloud solution. You can easily connect to your GeoCat Live instance by creating a GeoCat Live account and start publishing your maps and metadata to GeoCat Live (we are offering free trial accounts). Bridge now supports adding multiple styles to a single WMS layer. 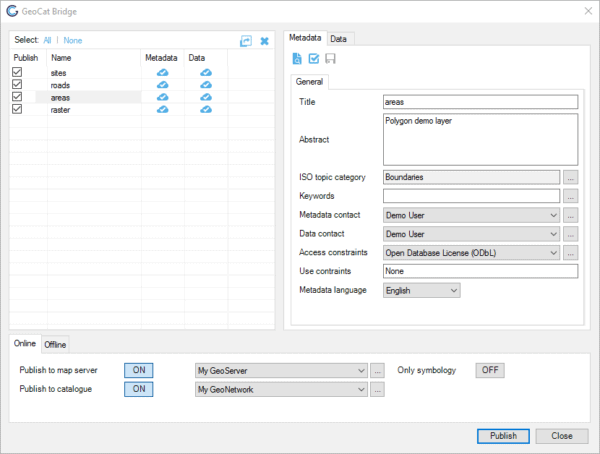 From the interface you can publish multiple layers that are based on the same dataset as multiple styles to the same WMS layer in GeoServer or MapServer. If you use layer groups in your projects, you can now publish them to Geoserver or Mapserver. The tree structure of the project will be available in the WMS capabilities. This feature requires managed workspace mode to be turned on. You can now export a full MXD including data as a single GeoPackage. We use an extension of the OGC GeoPackage specification to store data, styling (SLD), context (OWS context) and metadata within the GeoPackage. One of the first implementations of reading this extended geopackage is available for QGIS in the QGPKG extension. Bridge in combination with QGPKG therefore allows you to easily migrate any ArcGIS project to QGIS, including style, context (layer order/grouping) and metadata. Bridge 3 is also tested against the latest releases of GeoNetwork (3.4), GeoServer (2.13) and Mapserver (7.0). Bridge works with ArcGIS Desktop version 10.1/10.6. Besides the improvements and features listed above, the Bridge 3 release contains a number of other features and improvements. These are listed in the release notes.